Dr. Mark A. Creager is a Professor of Medicine and Surgery at the Geisel School of Medicine at Dartmouth, and Director of the Heart and Vascular Center at Dartmouth-Hitchcock Medical Center in Lebanon, NH. Dr. Creager earned his medical degree at Temple University in Philadelphia. He completed his internship, medical residency, and fellowships in Vascular Medicine and Cardiology at University Hospital in Boston. Dr. Creager is President of the American Heart Association and serves on its National Board of Directors. 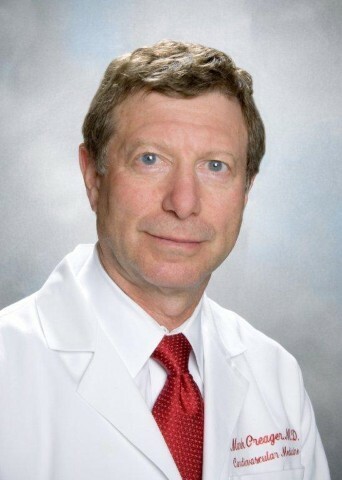 He is an editor of the textbook, Vascular Medicine and the editor emeritus of the journal, Vascular Medicine. He is a Past President of the Vascular Disease Foundation, and a Past President and Master of the Society for Vascular Medicine. He is a Fellow of the American Heart Association, the American College of Cardiology, and the American Physiological Society and a member of the American Society of Clinical Investigation. His major research and clinical interest is in vascular medicine, specifically vascular regulatory mechanisms and the effect of treatment on patients with peripheral artery disease. He is the author of more than 350 published contributions to the medical literature, including: research papers on vascular function, book chapters, and monographs on vascular disease. Dr. Creager has been recognized with several prestigious awards and honors, including the Vascular Disease Foundation President’s Award for Leadership and the American Heart Association Council on Peripheral Vascular Disease Distinguished Achievement Award. *Dartmouth-Hitchcock Nursing Continuing Education Council is accredited as a provider of continuing nursing education by the American Nurses Credentialing Center’s Commission on Accreditation. This educational activity carries 1.0 contact hours.